Raw food diets have exploded in popularity in recent years; some believe that the cooking process destroys nutrients and even produces dangerous chemicals by the interaction of heat with fat, protein, and carbohydrates. Enter Aaron Ash, a charismatic chef whose organic raw vegan restaurant Gorilla Food has taken Vancouver by storm for its inventive and delicious dishes, all prepared without use of animal products or a stove. 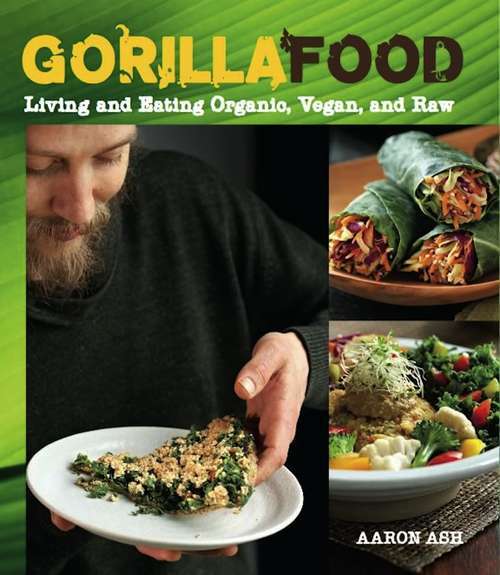 Aaron is a conscientious raw vegan whose beliefs about food are tied to personal and social well-being. Gorilla Food strives to promote the idea that a sustainable, healthy culture depends on humankind living as "lightly" as possible, mitigating the damage wrought on the environment and ourselves. Gorilla Food the book is both an innovative cooking manual and a raw vegan bible; recipes include a raw lasagna made with zucchini noodles, kale, and a "cheese" made from walnuts, and a raw soup made from seasonal greens, tomatoes, and avocado. There's also amazing raw pizzas, fruit pies, and chocolate desserts that will delight vegans and non-vegans alike with their complex flavors. The book also contains recipes for dehydrated and cultured foods, important for a raw food diet but surprisingly simple to prepare. Gorilla Food will make you go ape for living life to the rawest! In addition to running Gorilla Food, Aaron Ash was a former personal chef to Mike-D of the Beastie Boys. He is also an in-demand caterer for high-profile events around North America, and is making plans to open additional Gorilla Food locations.